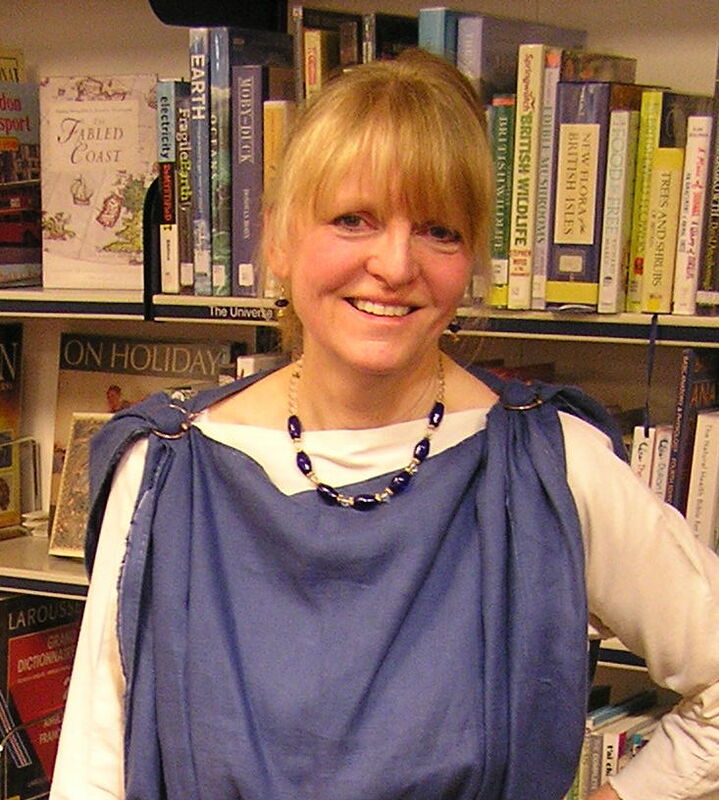 Huge thanks to everyone who came to Ilfracombe Library on Thursday to enjoy drinks and nibbles and witness the strange sight of an author draped in pseudo-Roman clothes (well, it was World Book Day, when you are allowed to dress up). Ilfracombe’s library is perched on a hill overlooking a dramatic rocky beach and must have the best views of any library in the country. Obviously it would have been better to have some shots of the audience (they were there, honestly) but by the time we had the camera sorted out, most of them had escaped. Many thanks to Colin, without whose batteries there would have been no photographic evidence at all, and to Jonathan, who did the pressing of buttons. Thanks also to the staff at the Library and everyone who helped to spread the word, including the lovely Paul at The Voice radio in Barnstaple, whose soothing influence hopefully helped me produce something akin to coherent sentences on air. Strange how the thought of speaking to invisible listeners is terrifying for someone who’s quite prepared to stand in front of 30 people in fancy dress. You missed a trick Ruth. I can’t see any of your books behind you. Not good product placement! hi there, just looked at the pictures of the Ilfracombe library, how great it would be to wander through it, looking at that coastline. and how great it would have been to see you there. maybe you could come to the states for a book tour; can’t promise you as magnificent a view, but both the new york public library and the philadelphia free library are quite beautiful! Very fetching, Ruth – but I want to see the belt. How were you held together at the waist? Good question! I have to admit that the belt is the trickiest part of the whole outfit and I haven’t got it right yet. At the moment I use a woollen braid, very authentically (if unevenly) tablet-woven by mine own fair hand. But if I hang anything from it, as I have to because we don’t have any evidence for pockets, it looks squiffy. So having given this some thought, I’ve concluded that I need a very long braid and to wrap it around twice – once for the waistline and once to hang purse/keys etc. on. What do you think? I’m going to be on the lookout for evidence of women wearing leather belts, which would solve the problem once and for all. Yes I wondered about frondy-type leather but couldn’t get hold of any in time. I shall ponder further once I’m past the looming deadline! What a cute idea!!! I love that you dressed up! But I agree with another commentor. You should have had your books lined up behind you so that we could see the covers. It would definitely drive it home! Well….def next time set up the shelf and stock up on batteries! But I think that it was an awesome idea and very cute to dress up, reflecting the theme of the era in the book. People don’t know how hard we work on these books and I know that customers would surely appreciate the joviality it would bring to a book signing. Not to mention original. I may not know what I’m talking about, but I clearly don’t remember any other authors coming up with the idea. 😉 How is your series doing? I have to confess, Dean, that like a lot of good ideas it’s borrowed! I’m pretty sure Jane Finnis has been known to dress up for signings and Pat Mcintosh definitely does – here’s the proof – http://img1.fantasticfiction.co.uk/images/1/5429.jpg. 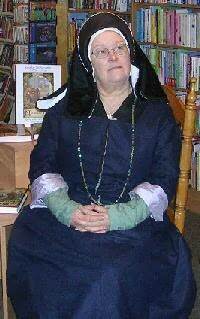 As you see, she writes medieval fiction. So what would a horror writer wear to go to a book event? That picture is hysterical! Ok, so maybe not an original idea, but I would have to bet for most readers it would be a fresh new sight! I please ask forbearance for this message. I have very much enjoyed all of your novels and I enjoy dropping in on your blog from time to time. You have replied to my comments so thoughtfully and graciously. The need for the forbearance is this: This comment is not about your books, or the delightful little adventures and goings-on reported in the blog. You are the only British person I know enough to addess and I feel a great need to do so. The news today is that Margaret Thatcher has passed away. First, I have the very highest of respect and admiration for your great nation and your great people. If it were not for your great nation, I am convinced that civilization would have come to an end in the 1940’s. I was in Washington, D.C. on that day of September 11, 2001; staying across the road from the Pentagon. I watched the Pentagon burn for a week. I saw a patch of green lawn near the Pentagon completely covered by white cloths laid over the bodies of those who had died and been pulled from the building. You played our national anthem at Buckingham Palace on the occassion of the attack on the United States, September 11, 2001. I wept when I saw that on the news. I wanted to thank someone from Britain, but knew no one. I found the address of the British Embassy in DC, and started off on foot to find it. I was working in DC on assignment, did not know my way around, but after some hours of walking, I found it. (There were few people to ask, as the streets of DC were empty for days after the attack) I went into the embassy and was directed to a guest register. I wrote my thank you and left my signature in the book. As I left the building, my heart was very heavy because I did not feel it was enough. So, here you are Ms. Downie, in harms way because I don’t know who else to tell this to. My very sincere condolences on the passing of Mrs. Thatcher and a thank you. Mrs. Thatcher was such a great friend and ally to the United States. I fear that the United States would not win an international popularity contest, however it seems that whenever it counts, you are there for us. I remember back in the early 1980’s, Lybians were assasinating our servicemen in Germany by shooting and explosives. The United States wanted to retaliate, but France and Spain would not have it. Britain allowed us to fly F-111 bombers from your country. They flew a very circuitous route with refueling and bombed Lybia, killing some of Gadaffi’s family. It is a terrible, terrible thing to think of having to do such, but afterwards the assasinations ceased. What a difficult thing, but I thank you for standing with us when we needed a friend. In the late 1960’s, I was serving about the USS Woodrow Wilson, a polaris, nuclear powered submarine. We were stationed at Holy Loch, Scotland near the lovely town of Dunoon. The people were so friendly, so gracious, I can never forget it. My assignment there was such that there was very little time off. One day, I was able to get a day and visited Glascow with a fellow shipmate. We had to wear our uniforms, so we stuck out in the crowd despite our best efforts to keep our heads down. Well, turns out, Dunoon had not cornered the market on high hospitality. We were treated so well. Seemed like everyone was all smiles and so friendly. I shall never forget it. On the occassion of the news of Margaret Thatcher, all of this has come to my mind, landed in my heart and just has to go somewhere, and I hope you will forgive me. I am not singling you out. It is just you are the only one I know over there. My very sincere condolences, and my thanks to your great nation. Thanks which I wish I could express better than I have. Phil, thank you so much for taking the time to write this. I fear I’m not a worthy recipient but as I’m the only Briton you know, I’m honoured to host it here on the blog. You are absolutely right about the mood here after the terrible atrocities on 9/11. Everyone I spoke to was stunned and appalled. Your account of the day – and the days that followed – is very moving. Mine is less so: having heard the news on the car radio, I drove to the garage and started to fill the car with petrol. This wasn’t really a great idea, as it was a diesel engine. Luckily no harm was done, but that’s just a silly illustration of the shock and distraction that most of us felt. The usual TV and radio schedules were scrapped, the media coverage was wall-to-wall, and a surprising number of people turned out to own stars and stripes and put them on display. Everyone wanted to help: nobody knew quite what to do. The phones were down so no-one could ring to check on relatives, and I recall that our Vicar opened the church that evening for prayer. As for American forces over here – the beaches near where I live in Devon were used as training grounds for the D-Day invasion. I recently went to an evening of “memories of the war” in a local village hall where elderly men who were boys in the 1940’s recalled the excitement of having the village full of US troops – the fun of being offered rides on the jeeps, and apparently if you claimed to have an older sister you might be offered a lift all the way home! And then one day, the children woke up and the place was silent. No tramp of boots: no roar of engines. The soldiers were gone, and the invasion was about to start. Obviously many of those young men never went home, and there’s a memorial to them overlooking the wide sandy beaches where they trained. We have much shared history.